Updated at 5:15 p.m. July 31, 2018. The National Weather Service has issued a flood advisory until 10 p.m. Tuesday for southeastern San Diego County because of heavy rain from thunderstorms in the area. Radar detected heavy rainfall near Banner, Mount Laguna, Boulevard and the Imperial County Line around 4 p.m. from several strong thunderstorms in the area, the NWS said. The storm near Banner is also expected to produce pea-sized hail, wind gusts up to 50 mph and may intensify as the evening progresses, according to the NWS. A significant weather advisory has been issued for the area until 5 p.m. Forecasters say the heavy rainfall will likely cause rural and small stream flooding in the advisory area. 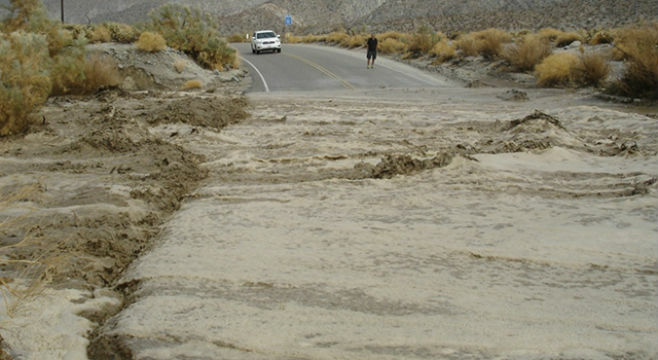 “San Filipe Creek will likely experience significant water flow,” the NWS said. If you see a flooded road, “turn around, don’t drown,” the NSW said. Most flood deaths occur in vehicles, the agency said.